Today I have created another card using Susan’s new Garden Notes Watering Can and Garden Notes Calendula. If you couldn’t tell I love watering cans the picture in circle is actually part of my collection that I have. Here is how card was created. Step 1 Form 6″ X 6″ card base using white 110# Soft Finish Cardstock. Step 2 Cut white 90# Soft Finish Cardstock 5-3/4″ square. Using 6th largest die from Garden Notes Frame It – Stitched Circles cut circle in cardstock approximately 1/4″ in from left side and 1/4″ down from top. Step 3 Choose patterned paper, picture or use inks to make a back ground then cut using 7th largest circle die. Using Clear Double Sided Adhesive adhere behind opening then adhere to card front. Step 4 Using black ink stamp sentiment to lower left corner of card. 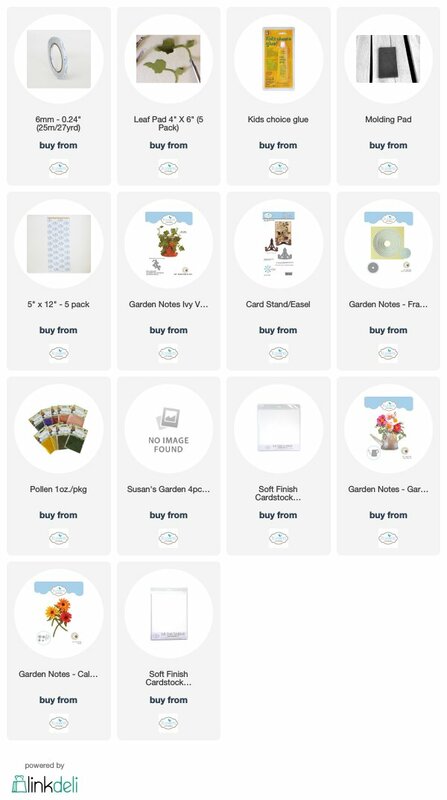 Step 5 Cut 2 Garden Notes Watering Can from cardstock with Clear Double Sided Adhesive on back – 1 gray 1 white. Adhere white over gray one. Using alcohol markers color and shade. Add silver Metallic Rub Ons to watering can. Step 6 Cut 3 Garden Notes Calendula from white 90# Soft Finish Cardstock. Using alcohol markers color and shade. Using Susan’s 4 pc. All Metal Tool Kit and Molding Mat shape flowers. Susan has a video on making these flowers you can find it here. From green cardstock cut several leaves shade with distress ink. Shape using leaf tool from tool kit along with leaf mat. Step 7 Cut Garden Notes Ivy Vine from white Soft Finish Cardstock using green alcohol marker to color ivy leaving white around edges then shape. Step 8 Remove protective paper from back of watering can add a couple pop dots lower center adhere to card front. Add ivy vine using Kids Choice Glue. Build flowers to watering can then add leaves. Step 9 Add pearls upper left edge of circle. Hope you have enjoyed my tutorial and it has inspired you. 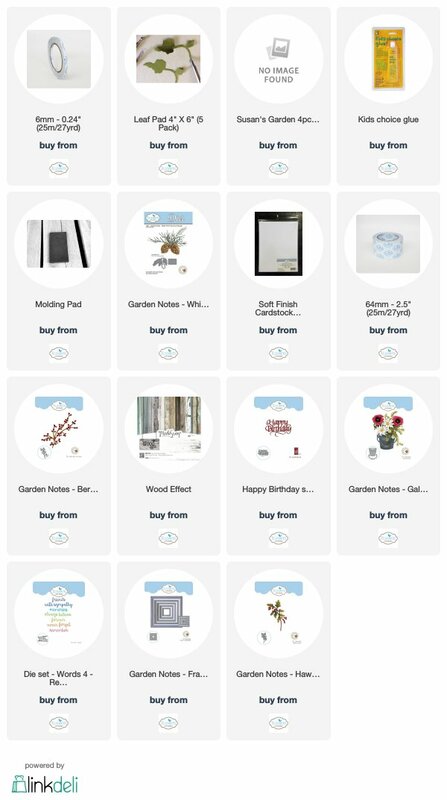 For any of the Elizabeth Craft Designs supplies click on any of the images below it will take you directly to their site it does not cost you any extra but I do get a little something for it. 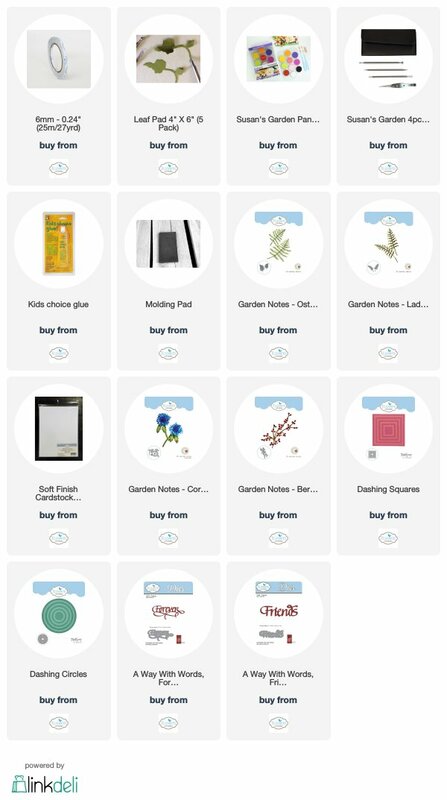 Welcome my crafty friends! Happy New Year to all it has been a while since I posted anything so to start I wanted to share my thank you cards that I created . No tutorial just wanted to share they are so easy. Thanks for stopping by I have a couple of posts that I am working on now just need to finish tutorials. Today I am posting another “Forever Friends” card. Last month I posted a card I had made for my dear friend of over 50 years it had bachelor buttons on it well she showed it to a friend where she lives and the friend wanted a couple of cards one of which was just like hers and another one so here it is. I chose to use Susan’s Garden Notes Lilac 2 die set. Step 1 From green cardstock cut Garden Notes Leafy Branch. Using Nuvo Crystal Drops – Simply White add berries to branch set aside to dry then repeat on back. Step 2 Form 6″ X 6″ card base from white cardstock. Step 3 Cut patterned paper 5-3/4″ X 5-3/4″ patterned paper (ModaScrap Fly & Scrap used here). Adhere to card front using Clear Double Sided Adhesive. Step 4 From black cardstock with Clear Double Sided Adhesive on back cut Forever Friends using A Way With Words dies Forever and Friends. Adhere to card front putting Forever to top left of card and Friends to lower right of card. Step 5 Cut Garden Notes Ostrich Fern from green cardstock. shade with ink shape by pinching up on fronds. Using Kids Choice Glue on stem area only adhere to center of card. Step 6 Add berry branch over fern using Kids Choice Glue. Step 7 Make lilacs using Garden Notes Lilac 2 set. You either cut flowers from white Soft Finish Cardstock and color with alcohol markers, cut from colored cardstock or as I have done colored cardstock first by lightly brushing marker over some areas darker in others then cut which gives variation in color. My lilacs are really much more purple it is the picture. Susan has a video on how to make the lilac on her Facebook page Susan’s Garden Club. You can find it at this LINK. These are built right on your card. I do hope you have enjoyed my card today and will now make your own. 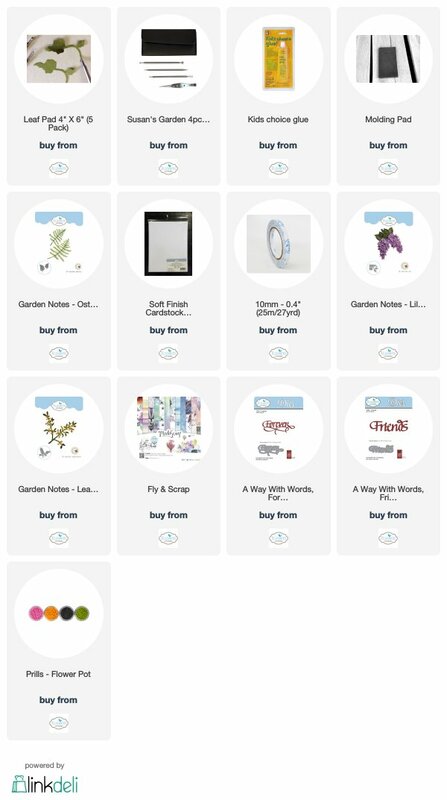 For any of the Elizabeth Craft Designs supplies I have used in this project you can just click on icons below and it will take you directly to their site.